The cure has become the poison in the sparse grasslands in northwestern China: fences wrapped with barbed wire meant to preserve the ecosystem in Qinghai are, ironically, killing off an endangered native animal. 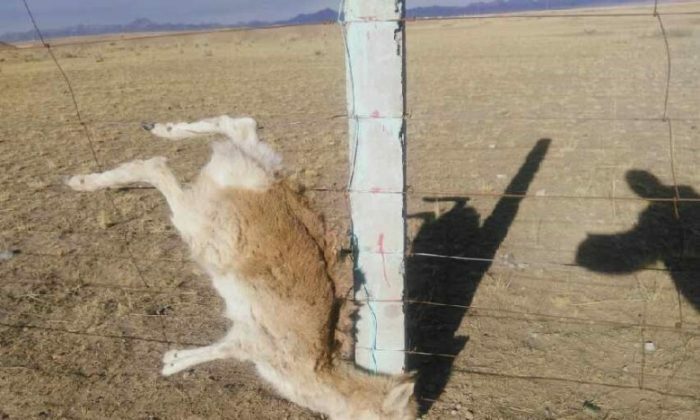 Recently, photos of seven dead Przewalski’s gazelle trapped in spiked fences in Qinghai were circulated on the Chinese Internet. The Przewalski’s gazelle is only found in China, and is identified on the International Union for Conservation of Nature (IUCN) Red List of Threatened Species as an endangered animal. A 2008 IUCN estimate places the number of mature individuals at about 350 to 400; Qinghai authorities claim that there are 1092 gazelle as of Dec. 2014, according to The Paper, a semi-official news website. The 4-5 feet tall spiked fences was erected by the local Qinghai authorities to preserve the grassland ecosystem, according to Oriental Net, a Hong Kong-based media outlet. Local herdsmen in Qinghai told The Paper that the fences was placed “too high” for the Przewalski’s gazelle to leap over, resulting in their deaths. Environmentalists working in Qinghai drew a similar conclusion. According to an April 2007 report by China’s agricultural ministry, the Chinese authorities plan to cover 150 million hectares of grassland—an area spanning the provinces of Qinghai, Tibet, Inner Mongolia, Xinjiang, Gansu, and Sichuan—with spiked fences by 2020. 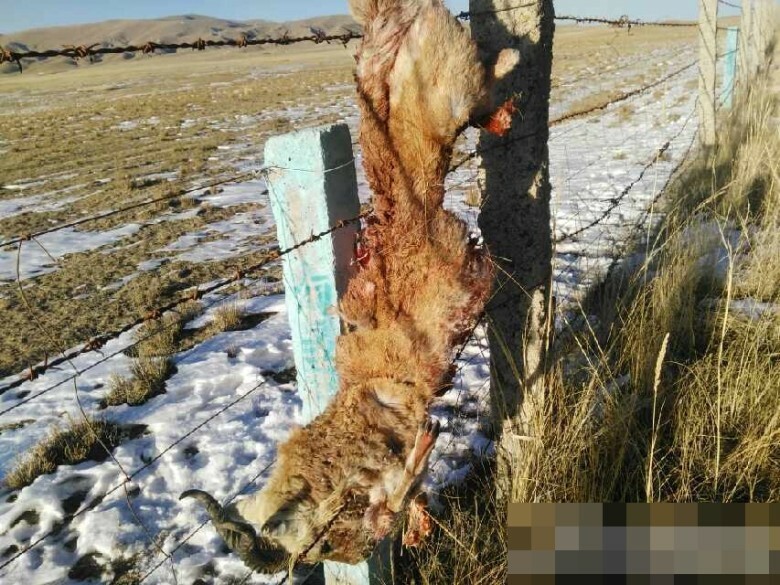 Chinese Internet users took to Sina Weibo, a popular Chinese microblogging service, to express their sorrow over the dead gazelle and criticize the Qinghai authorities for erecting the spiked fences. “Who came up with such an idiotic plan?” one netizen wrote. 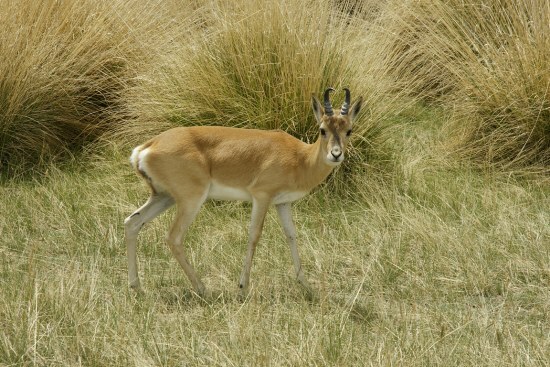 When cornered with the awkward problem, the Qinghai government tried to downplay the death of the endangered gazelle with figures: the Qinghai forestry department claimed that there was an average of 5 gazelle deaths due to predatory attacks, sickness, or natural causes between 2013 and 2014 when contacted by the China Biodiversity Conservation and Green Development Foundation, a public fundraising foundation registered with China’s Ministry of Civil Affairs, according to The Paper. But Shao Wenjie, the founder of Chinese environmental NGO Nature University, claims that seven gazelle have already died in 2016, The Paper reports. And Qinghai herdsmen say they observed over 20 gazelle killed by spiked fences in 2013. Some in China have made a business of fishing out the contaminated pig corpses, which then end up on the market. A scandal enveloped the zoo after tourists were found to be mounting giant tortoises and forcing them to walk by poking them with a screwdriver.